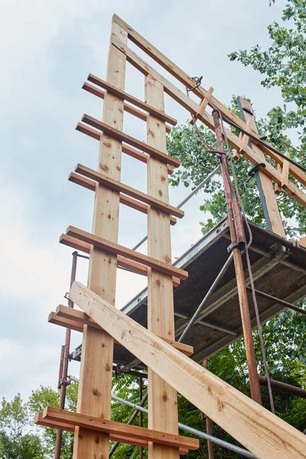 Hou de Sousa, view of Folly 2016: Sticks at Socrates Sculpture Park, 2016, New York. Courtesy of the artists. 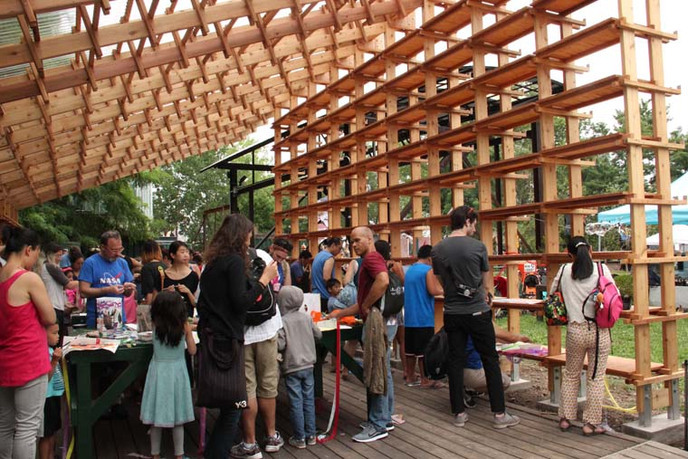 Through this annual competition, studio residency, and exhibition, Socrates Sculpture Park and The Architectural League of New York explore the intersection of architecture and sculpture. 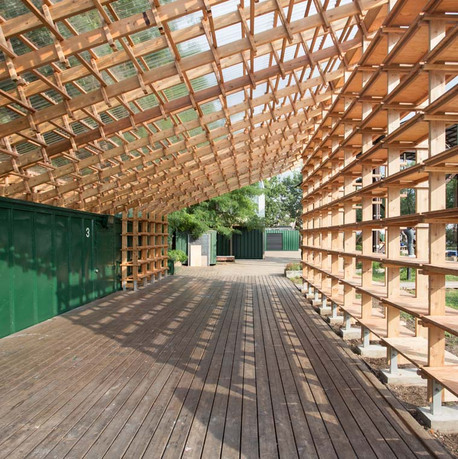 The Folly program offers one architect, designer, or team the opportunity to realize their architectural vision in the public realm. 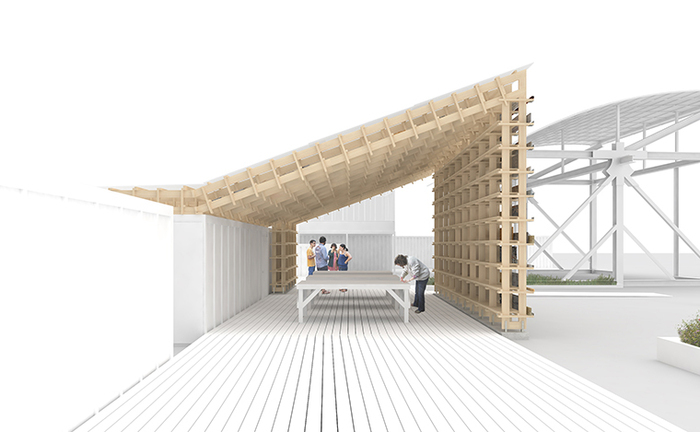 The Folly program has grown from a pilot to a highly anticipated annual competition to conceive, design, build, and exhibit original architecture on the East River waterfront. Now in its fifth year, we have challenged applicants to produce a work that is more function than folly by addressing a real need in the park. 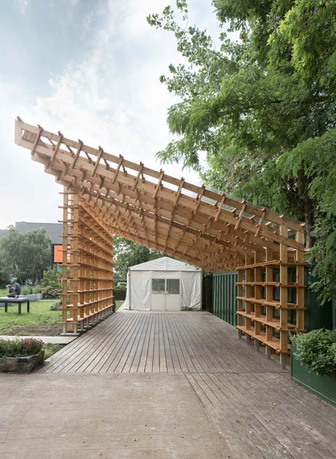 The result was the New York City-based firm Hou de Sousa with their inventive proposal Sticks—a structural space-frame that acts as both a wall and roof system. 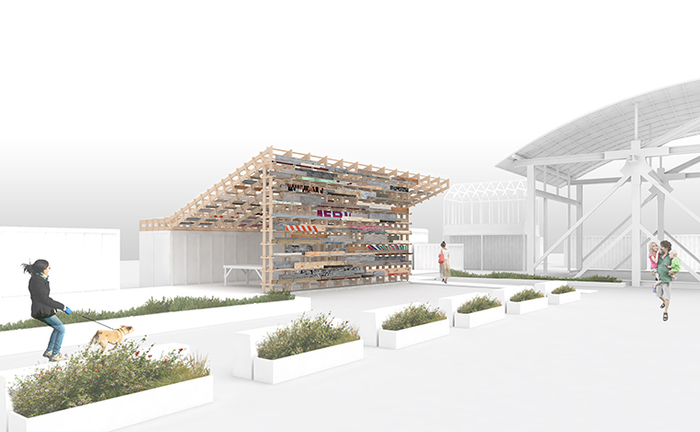 Hou de Sousa's proposal was selected from submissions from around the world and reviewed by a jury of five esteemed architects and artists, comprising Jarrod Beck (artist and 2012 Emerging Artist Fellow), Stella Betts (LEVENBETTS), Lauren Crahan (Freecell Architecture), Giuseppe Lignano (LOT-EK), and John Hatfield (Executive Director of Socrates Sculpture Park). Hou de Sousa is an award winning New York-based architecture and design office with domestic and international experience designing and managing projects from initial concept through construction. Built work includes restaurants, private residences, public spaces, and art installations. The studio promotes innovative design solutions that are culturally progressive and environmentally responsible. Hou de Sousa was founded by Nancy Hou and Josh de Sousa. Originally from Shanghai, Hou grew up in Quito, Ecuador and went on to receive her BArch from Cornell University and her MArch from Harvard University. She has designed commercial and residential projects in both New York and Quito, including several Michelin star-awarded restaurants. 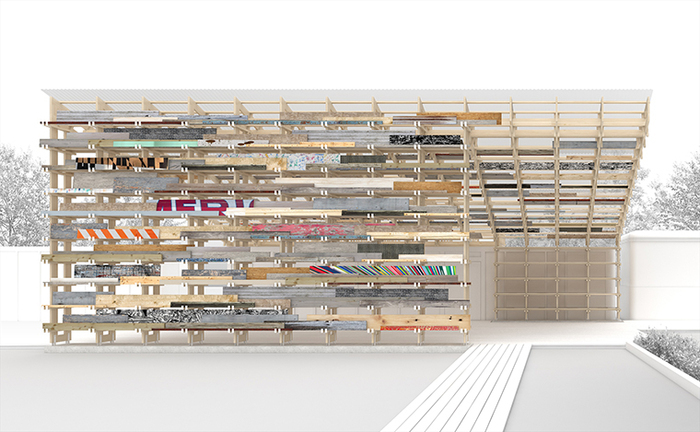 Prior to founding Hou de Sousa, Hou worked at Kohn Pedersen Fox and Slade Architecture. She is the creative director of HAAUS (Harvard Alumni Architectural and Urban Society) and a professor at Parsons School of Design. Born and raised in Massachusetts, de Sousa also received his BArch at Cornell University and MArch at Harvard University. He has designed residential, public, education, and commercial projects, including GreenPIX, a sustainable media wall in Beijing. Before founding Hou de Sousa, he worked at Skidmore Owings & Merrill, Joel Sanders Architect, and Office for Metropolitan Architecture. de Sousa also teaches at Parsons School of Design. 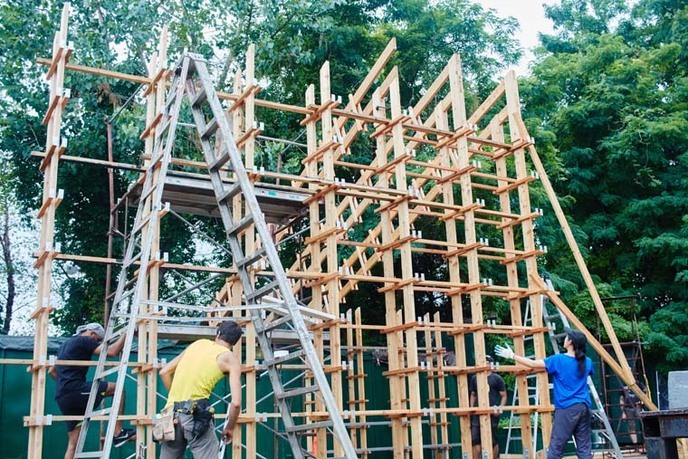 John Hatfield is the executive director of Socrates Sculpture Park. Previous to Socrates, he worked for seventeen years at the internationally acclaimed New Museum of Contemporary Art. There, he served in the capacity of deputy director from 2008, while holding variousother positions from 1992 to 2002, and 2004 to 2011. As deputy director, Hatfield contributed to the development and execution of strategic planning in all areas of the museum. In addition to his tenure there, Hatfield served as assistant vice-president for Memorial, Cultural, and Civic Programs at the Lower Manhattan Development Corporation, where he worked on the 9/11 memorial design competition, selection processes, and cultural planning. Additionally, he has held positions at the World Financial Center’s Arts and Events Program, consulted on public art projects and architecture, worked for modern and contemporary art galleries, served as a visiting critic at Yale School of Architecture, and participated on Percent for Art panels. Rosalie Genevro is the executive director of the Architectural League of New York. For over twenty years, she has pursued its mission—to nurture excellence and engagement in architecture, design, and urbanism—through innovation in live events, exhibitions, and publications. Genevro has conceived and developed projects that have mobilized the expertise of the League's international network of architects and designers towards applied projects in the public interest, including Vacant Lots, New Schools for New York, the Productive Park, Envisioning East New York, and Arverne: Housing on the Edge; initiated and directed major traveling exhibitions including Renzo Piano Building Workshop: Selected Projects and Ten Shades of Green and Urban Life: Housing in the Contemporary City; and originated the online projects Worldview Cities and Urban Omnibus. Earlier in her career, Genevro was research director of Advisory Services for Better Housing, and published research on the early years of the NYC Housing Authority. Anne Rieselbach has been program director of the Architectural League since 1986. Rieselbach organizes many of the League's lectures and symposia, and has curated exhibitions of contemporary and historic architecture. For the past thirty years she has directed the Architectural League Prize for Young Architects + Designers and Emerging Voices series. The League Prize, a nationwide competition, lecture series, exhibition—and for the past thirteen years, catalogue—spotlights work by talented young architects ten years or less out of school. Emerging Voices, chosen through an invited competition, brings outstanding mid-career architects to New York to present their work. Jess Wilcox joined Socrates as the exhibition director in January of 2016. From 2011-2015 she held the position as programs coordinator at the Elizabeth A. Sackler Center for Feminist Art at the Brooklyn Museum, where she organized public programs and worked on the public artworks including Between the Door and the Street, a performance initiated by Suzanne Lacy; and Butterfly for Brooklyn, a pyrotechnic performance by Judy Chicago. She also cocurated Agitprop!, an exhibition of historical and contemporary art that changed over the course of nine months, at the Brooklyn Museum. She has curated projects and worked on various exhibitions at a variety of art spaces including Abrons Art Center; the International Studio and Curatorial Program; Performa; SculptureCenter; and Storm King Art Center, among others. She holds a BA from Barnard College and an MA from the Center for Curatorial Studies, Bard College. 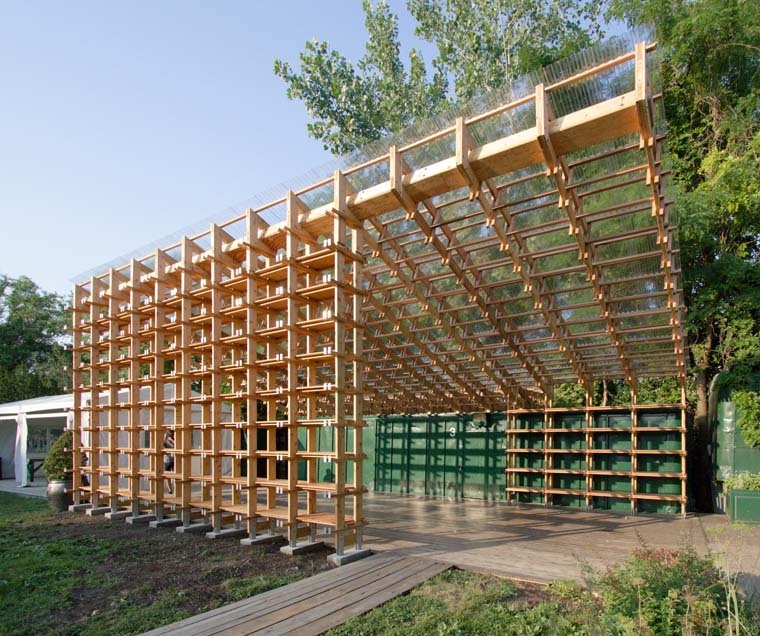 Celebrating its 30th Anniversary in 2016, Socrates Sculpture Park is the only site in the New York City specifically dedicated to providing artists with opportunities to create and exhibit large-scale sculpture and multimedia installations in a unique outdoor environment that encourages strong interaction between artists, artworks, and the public. 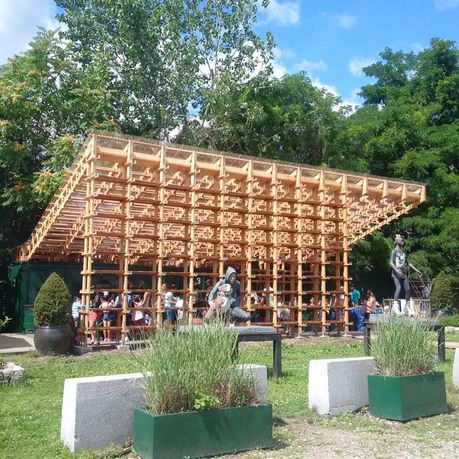 The park's existence is based on the belief that reclamation, revitalization, and creative expression are essential to the survival, humanity, and improvement of our urban environment.